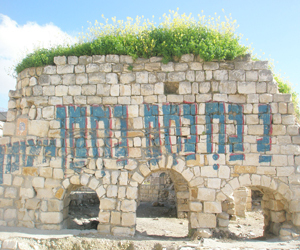 Tzfat has, even before the creation of the State of Israel, been known as a right-wing town. The pre-state paramilitary organization Haganah, which was connected to the Labor party, dominated the struggle for Israel's independence in most areas of the country, but it was matched in Tzfat by the more right-wing paramilitary, the Irgun. Menachem Begin, who was to go on to lead the Likud party (Labor's nemesis and its right-wing counterpart) once the State was declared, had hid in Tzfat while he was being hunted by the British army for his anti-British underground activities. He chose Tzfat because the town was full of his supporters who successfully kept the British at bay for years. Through the early years of the State's existence, the Labor party dominated Israeli politics, but the right-wing Likud could always count on Tzfat to keep a respectable presence in the Knesset. Local politics in Tzfat is not only a point of intense interest to local residents - it is an all-encompassing passion which allows the town of 30,000 to field more mayoral candidates every election year than cities ten times its size. For many years, the city was run by "Tzfassers" - old-time Tzfat families who could trace their linage in Tzfat back hundreds of years. It was accepted by all, and no one else would dare run - the Tzfassers believed that they were entitled to the mayoral seat, and no one else thought to object. By the late 1980s, a new political force arose; families of immigrants who had come from North Africa in the 1950s, and now felt that they were entitled to take power. A succession of mayors and city councils were made up of these residents, many of whom would not speak to each other because they came from areas in the "Old Country" where their grandparents didn't speak to each other. As time has passed, there has also been a movement towards a more religious representation on the council, as well as in the mayor's office. As the ultra-Orthodox population of the city grows, the presence of religious city council members increases, to the point that today, eighty percent of the city council is connected with a religious stream, and even the mayor, the first one in 20 years who does not wear a kippa (skullcap) in public, is known to be quite traditional (and made sure to ask for the blessings of the town's important Rabbis before the election). As for political ideology, one can simply note that the last time a left-wing party fielded a candidate in Tzfat, the number of votes that they received was so low that the party, successful in other parts of Israel, has never even bothered to have a candidate run in Tzfat again.